The Vietnamese Government supports and creates the best possible conditions for Belgian businesses and investors, including those from the Flanders region, Prime Minister Nguyen Xuan Phuc has affirmed. He told visiting Minister-President of the Flanders region Geert Bourgeois in Hanoi on May 14 that Vietnamese businesses want to cooperate with Belgian partners, and the Vietnamese Government encourages local people and enterprises to enhance business cooperation with firms from the EU, including Belgium, as the two sides hold substantial cooperation potential. The number of 80 Flanders businesses accompanying Minister-President Geert Bourgeois during his visit to Vietnam has demonstrated their confidence in the country’s economic development, he said. Vietnam attaches importance to economic and trade ties with the European Union (EU), and Belgium and the Flanders region in particular, the leader stressed. 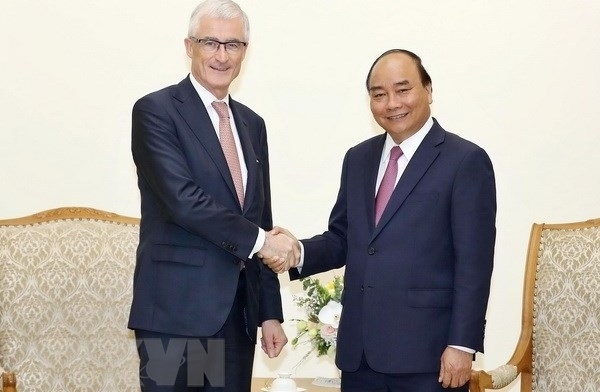 He said that Vietnam highly values Belgium’s role in the EU as well as the country’s cooperation and support for Vietnam across fields, particularly in education, training, economy and trade. Vietnam’s signing of the free trade agreement with the EU aims to promote collaboration between the two sides, he said, expressing his belief that Belgium will encourage other EU member countries to soon approve the deal. The PM told his guest that Vietnam and Belgium are expected to sign a strategic cooperation program in fields of agriculture, fishery, husbandry and floriculture, among others. For his part, Minister-President Geert Bourgeois highlighted the long-standing relations between Vietnam and Belgium as well as the Flanders region, saying the working sessions between his delegation and Vietnamese ministries and agencies over the past days reaped fruitful outcomes. The Minister-President noted his support for the approval of the EU-Vietnam Free Trade Agreement and held that the pact would create a momentum for economic and trade links between Vietnam and EU member countries. The Flanders region exports EUR4.92 million (US$5.8 million) worth of goods to Vietnam but imports only EUR2 billion from the market. The reality shows that goods made in Belgium and Vietnam, especially farm produce, are not competitive but supplementary, enabling the two countries to boost cooperation in trade and investment.